The Eagle has the longest life-span of its species. It can live up to 70 years. But to reach this age, the eagle must make a very difficult decision! Its long and sharp beak becomes bent. Its old-aged and heavy wings, due to their thick feathers, stick to its chest and make it difficult to fly. This process lasts for 150 days (5 months)the process requires the eagle to fly to a mountain top and sit on its nest. There the eagle knocks its beak against a rock until it plucks it out. Then the eagle will wait for the new beak to grow back after which it will pluck out its talons. When its talons grow back, the eagle starts plucking its old aged feathers. 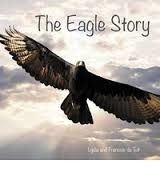 If an eagle can make a life saving and life changing decision at the age of 40....why can't we? In order to take on a New Journey ahead, let go of your negative old limiting beliefs. Open up your mind and let yourself fly high like an eagle! When it rains, all birds occupy shelter. But the EAGLE avoids the rain by flying above the clouds....The problem is common to all but the attitude to solve it makes the difference! Don't be afraid of change...accept it gracefully!